Turkeys can be a great addition to many backyard farms, but they aren't right for everyone. Before selecting chicks and starting a flock, it is best to understand what turkeys need and how they are different from other poultry. The first step in raising turkeys is to be sure they are permitted in your area. While suburban and urban backyard farms are becoming more acceptable and widespread, not all areas allow turkeys as livestock. Check city zoning codes or homeowners association regulations to be sure your turkeys will be welcome. It is also important to understand that turkeys are different than other poultry, and they may not be the best choice for your farm. Turkeys can be much louder than other fowl, as well as messier, and in tight neighborhoods, they may be less welcome. Turkeys do not generally lay many eggs, but they can be a great source of meat. Providing your turkeys the best possible care, however, can be more expensive than simply buying a ready-to-cook turkey at the grocery store, so if the only consideration is saving money, it may not pay to raise turkeys. If you are concerned about how the turkey is raised, however, such as avoiding growth hormones and opting for organic feed, it can be rewarding to raise your own turkeys. 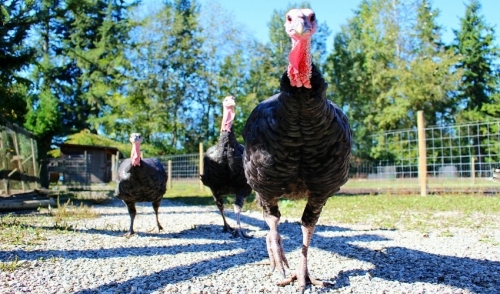 Choose the Right Breed: Commerical turkeys (broad-breasted birds) are selectively bred for more breast meat, but they are noisier and can be more difficult to raise. Heritage breeds are a better choice for most backyard farming, and may have richer tastes after processing. Start Early: If you plan to eat one of your turkeys for Thanksgiving, you should have the chicks no later than early to mid-June so they can mature and reach their full growth before the holiday. You can adjust when you start chicks to coincide with other holidays if preferred. Provide Proper Habitat: Young chicks are best raised indoors until they can regulate their own temperature, and they will need heat lamps and good bedding to stay warm and healthy. Shelter should be draft-free, but as they grow, they will become more tolerant and can stay outdoors. Control Garden Access: Turkeys will happily pick away at insects in the yard and garden, but they may nibble on plants as well. Fencing off the garden can keep the birds away from tender plants, but be aware that turkeys can fly and may invade the garden if they do not have enough room in the yard to forage or if their food supply runs short. Provide a Nutritious Diet: Young turkeys need a protein-rich diet for proper growth, but their nutritional needs change as they grow. Monitor your turkeys' diet carefully and adjust feed proportions as needed, providing the occasional treat of fresh vegetables for variety and interest. Provide Adequate Water: All poultry, including turkeys, needs a constant supply of fresh, clean water for drinking. In winter, use warm water or a heated dish to keep the water from freezing, but dishes should always be shallow so there is no risk of young birds drowning. As the turkeys mature, larger dishes can be used. Learn How to Dress the Turkey: If you plan on processing the turkeys yourself, learn how to butcher them properly. It may help to observe another farmer's techniques, or get tips from local turkey enthusiast groups. Before processing, do not feed the turkey for 24 hours, and do not give it water for the last 12 hours to make the task easier and neater. Keep Emotions in Check: Backyard turkeys can be charming, and may quickly seem like feathered pets as they follow you around the yard and develop their own personalities. The more emotionally attached you get to the birds, the harder it will be to butcher them at the appropriate time. Keep your own emotions under control, and be sure that other family members, especially children, are not growing too attached to the turkeys. It can be rewarding to raise turkeys on a backyard farm, and many urban farmers enjoy how much more delicious their home-grown turkeys can be. By understanding the characteristics that make turkeys unique and what is necessary to raise them comfortably, these fun fowl can be a great part of your small farm.